Explore electricity and learn about circuits with four fun, hands-on stations. 1 set of Snap Circuits Jr.
-Read up on how Squishy Circuits work, so that you can adequately give verbal instructions to children at that station. -Try doing the lemon battery experiment at home first so you can learn how it works and what to troubleshoot. -Set up 4 separate stations: Lemon Batteries, Squishy Circuits, LEGO WeDo, and Snap Circuits Jr.
-Set up the laptop and make sure that the LEGO WeDo software works. We found it helpful to create 4 separate stations for this program, where small groups of participants rotated through approximately every 15 minutes. We had three staff members for this program: 1 overseeing the lemon battery station, 1 overseeing the Squishy Circuits station, and 1 floating back and forth between the LEGO WeDo and the Snap Circuits Jr. stations (both of which are more self-explanatory). Those overseeing the lemon battery and squishy circuits stations explained the procedures for making the LEDs light up. 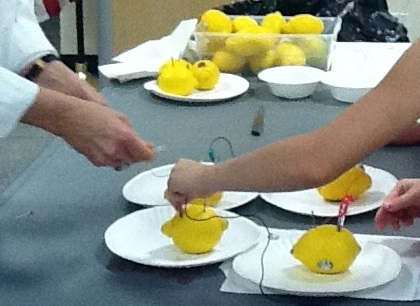 Those details can be found in the links to squishy circuits and lemon batteries below. 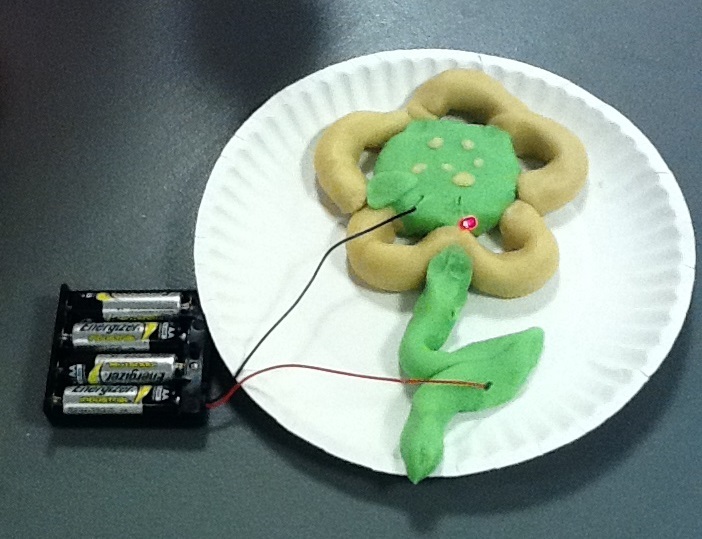 It is worth letting them play with the design of squishy circuits, though–they come up with stuff like the electric flower in the photo above! For the LEGO WeDo station, it’s advisable to have the kids work together to build 1 project, since their time is very limited. Discovery Kids: How Do Electric Circuits Work? Physics Van: Why Won’t My Lemon Battery Work? For a much younger audience, please see our STEAM Storytime: Electricity & Magnetism post. Between the stations presented here and the ones presented in the STEAM Storytime post, we believe something similar to this program could be done for 1st-3rd graders. We would likely simply swap out the Lemon Battery project in favor of the MaKey MaKey Banana Piano with a 1st-3rd grade group, but keep in the Snap Circuits Jr and the LEGO WeDo.